Last season, Hawaii Five-0 made a habit of beating Castle in the ratings. This season, it also airs opposite NBC’s Revolution. How will it stand up to the additional competition? Will it be cancelled or renewed? 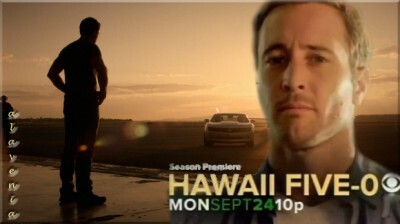 The third season of Hawaii Five-0 typically airs Monday nights at 10pm on the CBS network. The cast includes Alex O’Loughlin, Scott Caan, Daniel Dae Kim, Grace Park, Masi Oka, and Michelle Borth. Below are the TV show’s ratings for the 2012-13 season, the best way to tell if Hawaii Five-0 is going to be cancelled or renewed for season four. Final season averages: 2.2 rating in the 18-49 demographic with 9.02 million total viewers. 2.0 in the demo (+11% change) with 9.00 million (+15% change). Season averages: 2.15 in the demo with 9.02 million. 1.8 in the demo (-5% change) with 7.86 million (-2% change). Season averages: 2.16 in the demo with 9.02 million. 1.9 in the demo (+12% change) with 8.01 million (+3% change). Season averages: 2.17 in the demo with 9.08 million. 1.7 in the demo (-6% change) with 7.76 million (+1% change). Season averages: 2.19 in the demo with 9.13 million. 1.8 in the demo (-14% change) with 7.65 million (-11% change). Season averages: 2.21 in the demo with 9.20 million. UPDATE: Hawaii Five-0 has been renewed for a fourth season by CBS. 2.1 in the demo (0% change) with 8.61 million (-4% change). Season averages: 2.23 in the demo with 9.28 million. 2.1 in the demo (+5% change) with 8.99 million (-1% change). Season averages: 2.24 in the demo with 9.32 million. 2.0 in the demo (-5% change) with 9.11 million (-6% change). Season averages: 2.25 in the demo with 9.33 million. 2.1 in the demo (-9% change) with 9.64 million (-2% change). Season averages: 2.26 in the demo with 9.35 million. 2.3 in the demo (0% change) with 9.86 million (0% change). Season averages: 2.27 in the demo with 9.33 million. 2.3 in the demo (-34% change) with 9.85 million (-24% change). Season averages: 2.27 in the demo with 9.29 million. 3.5 in the demo (+46% change) with 13.03 million (+36% change). Season averages: 2.27 in the demo with 9.25 million. 2.4 in the demo (0% change) with 9.59 million (-9% change). Season averages: 2.17 in the demo with 8.93 million. 2.4 in the demo (-4% change) with 10.54 million (+7% change). Season averages: 2.15 in the demo with 8.87 million. 2.5 in the demo (+9% change) with 9.84 million (+6% change). Season averages: 2.12 in the demo with 8.71 million. 2.3 in the demo (0% change) with 9.32 million (-10% change). Season averages: 2.08 in the demo with 8.58 million. 2.3 in the demo (+5% change) with 10.30 million (+14% change). Season averages: 2.05 in the demo with 8.49 million. 2.2 in the demo (+5% change) with 9.02 million (+13% change). Season averages: 2.01 in the demo with 8.23 million. 2.1 in the demo (+5% change) with 7.96 million (+6% change). Season averages: 1.98 in the demo with 8.10 million. 2.0 in the demo (-5% change) with 7.53 million (-13% change). Season averages: 1.96 in the demo with 8.13 million. 2.1 in the demo (+11% change) with 8.70 million (+4% change). Season averages: 1.95 in the demo with 8.28 million. 1.9 in the demo (-5% change) with 8.39 million (+6% change). Season averages: 1.90 in the demo with 8.13 million. 2.0 in the demo (+11% change) with 7.95 million (-1% change). Season averages: 1.90 in the demo with 8.01 million. 1.8 rating in the 18-49 demographic with 8.06 million total viewers. Season averages: 1.80 in the demo with 8.06 million. Year-to-year, Hawaii Five-0 was down by an astounding 47% in the demo (vs a 3.4 rating) and 34% in viewers (vs 12.19 million). It should be noted that last season’s opener had the advantage of airing on the same night as the first Ashton Kutcher episode of Two and a Half Men. Still, this season’s opener represents an all-time low for Hawaii Five-0 in both the demo and viewers. That’s not good. Reference point: The 2011-12 season averaged a 2.9 rating in the 18-49 demographic and 10.67 million viewers. What do you think? Do you like the Hawaii Five-0 TV series? Do you think it should be cancelled or renewed for a fourth season? Hawaii Five-0: A Ratings Hit for CBS or Is the Show in Danger? I love Hawaii five 0.can’t wait to see Steve and Catherine, Kono and Adam,Chin ,Danny and Grace(monkey),Max and Kamekona.just love it. Five o. I look forward to it know it’s gone wanted to know what happen. Cancel it… Not nearly as good as the original. Just pure violence. Hope they get rid of McGarrett’s girlfriend next season. She is horrible!! I love Hawaii five0 I don’t ever want them to cancel it! I think it will make it .. i LOVE it. Love the old one and love this one. For the person that said Alex need to learn how to act.. well.. can u do better? Are u making the big bucks like him for what he does? He must be good when he’s still acting. So don’t Hate.. ok? There enough going on in this world. So anyway… Hawaii 5-0 cast , writers, producer, director , make up, doubles … and others that i might miss…GREAT JOB… GOD SPEED !! You are all awesome to me . By the way I forget to tell you that Hawaii Five-0 has been renewed for a fourth season! True Hawaii Five-0 lost viewers but still is strong and I think will bounce back! “bounce back”…LOL, When will this happen ?, there is only one episode left this season. I know when, when pigs fly , or same thing ,when Alex O. learns to act. Hawaii Five-0 is a great show however it runs opposite REVOLUTION. I watch REVOLUTION. They need to change TIME SLOT. The first season was really good and has gone downhill ever since. I will probably not watch season 4 since i have been disappointed with this season. I’m not sure what changed but the characters aren’t the same. The chemistry is not the same as in season 1. Sorry…the show is geared for childlike minds. This version is just plain horrible and watching the ratings drop gives hope to the salvation of intellect in TV world. Cancel the show. First season was good but each year the writing and acting got worse. I really tried to like it but sometimes I gotta just turn it off. To many forced characters and unfinished story lines. They start but go no where. My sentiments exactly. The writing has gotten consistently worse from season to season.